Please note that Pitts Theology Library will be closed from Friday, April 19 until Sunday, April 21 for Good Friday and the Easter weekend. The library will re-open at 7:30 AM on Monday, April 22. Please refer to the Table of All Libraries’ Hours for alternative study spaces! Join us this Wednesday, April 10th at 7:30pm in Cannon Chapel for an event held in collaboration with Pitts Theology Library’s new Exhibition Word for Word, Sense for Sense: The English Bible in History & Worship curated by Brady Beard with Kim Akano, Alexandra Mauney, and Brandon Wason. 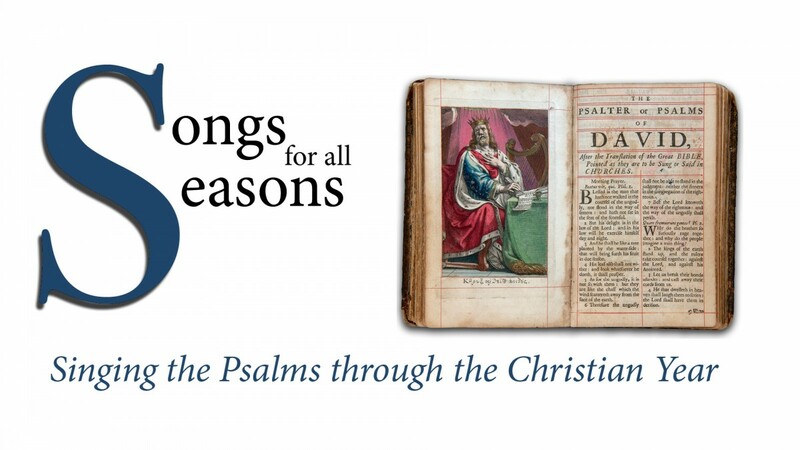 Enjoy a musical program featuring members of the Candler School of Theology, GA Sacred Harp Singers, Eastside United Methodist Church, and Columbia Theological Seminary communities. No registration is required, and all are welcome! A short reception will follow the program in the Candler School of Theology Atrium. View the program online here. Pitts Theology Library’s newest exhibition Word for Word, Sense for Sense: The English Bible in History and Worship opens next week on April 8th! Curated by Brady Beard, Kim Akano, Alexandra Mauney, and Brandon Wason, this exhibition invites visitors into a new appreciation for the history and contexts of the many English translations of the Bible. A special Thursday Honors will be held on April 11th at the Level 2 CST Atrium to highlight the opening – we hope to see you there! March 15th marked the final day of the “Materiality of Devotion: From Manuscript to Print” exhibition! We acknowledge the hard work from our curators, the Rose Library, and the Carlos Museum to make this collaborative exhibition a success. Remember, you can now view the catalog online and watch talks from the Exhibition Symposium on Candler’s Vimeo website. Stay tuned for information about the forthcoming exhibition: Word for Word, Sense for Sense: The English Bible in History & Worship curated by Brady Beard with Kim Akano, Alexandra Mauney, and Brandon Wason. Pitts will resume normal hours on Monday, March 18th. Our staff wish you a safe and relaxing Spring break! As Holy Week approaches, the to-do lists get longer and the time gets shorter! Even though it isn’t, strictly speaking, the “good news” of this liturgical season, Pitts does have some good news! Next week’s workshop will help you prepare for the busy season of Easter by exploring key resources for Holy Week worship services. In this workshop, we will look at resources for worship planning, preaching, and the selection of images and music. Register online to secure your spot! Payment is limited to CASH/CHECK ONLY. Emory Cards are REQUIRED for entry from 8:00-11:00am. Branded, reusable bags will be available to tote away your finds! It’s time to start thinking critically about your exegesis assignments! Pitts Theology Library has all the tools you’ll need online and in print to produce a successful paper. Learn about key strategies, resources, and how to best use them at Pitts’ Exegesis workshops this week – register at this link and enjoy a free lunch as a bonus! Pitts Theology Library is committed to improving the service we offer our community. To this end, each year, we ask users of the library to let us know how we’re doing, as a way of better understanding your experience of our staff, spaces, and materials. 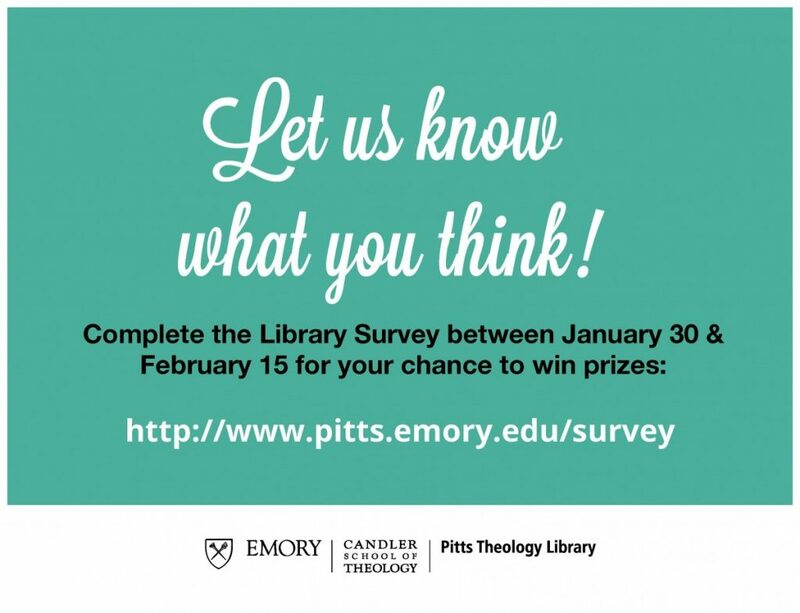 Please take a moment to tell us how we are doing by visiting pitts.emory.edu/survey. We value your feedback; each response helps us improve our existing services and address new needs. Once you complete this short survey, you can then enter to receive either a gift card OR early access to our annual Book Sale, which will be open from 8-4 on February 26th! Winners will get $10 to the sale or the opportunty to peruse all the books prior to the sale, selecting up to 10 books to purchase in advance. If you are selected, you will be notified via email, so make sure you enter your address correctly. Materiality of Devotion Exhibition Tours Now Available! We are also happy to arrange exhibit tours for all age groups at other times upon request. To arrange a tour, please contact Anne Marie McLean, Reference Librarian and Outreach Coordinator, at 404-727-5094 or amclea3 [at] emory [dot] edu.